We drive away from SLC later today...on another huge Scenic Byway adventure. It is hard to believe it's been just over two years that we sold and packed up the little house in Takoma Park and headed West to explore Salt Lake City. Now we pack up another place we've called home and head West again...and South. I guess it's time to update the information on the blog. The new base will be Pioneertown. More writing will now focus on life in California, life in the desert, and life building and living off the grid. 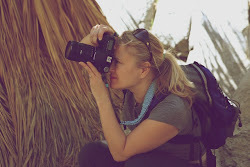 I am excited to explore the natural and the wild of this new Mojave desert scene, as well as the built environments that surround, including Pioneertown, Yucca Valley, Joshua Tree, Palm Springs, Palm Desert, Indio, and so on. Two hours from both Los Angeles and San Diego also promise a lot of city exploration and adventures. I write this as I sit for the last time in my bed, in this house that we will leave forever in a few hours. Isn't it such a strange feeling to wake up like you've done so many times before, but to know that this will be the last time in your place? Ever. It is a crazy feeling. To stare around at the empty rooms, closets and cupboards. In those moments you feel, raw and full force, how much we have routines in our lives, and what it feels like to have them broken. With the rooms completely empty except for our bed and some scattered bags and boxes, I recalled our first night here two years ago, when we slept on an air mattress on the living room floor in front of the fireplace because it was so late and we we were too exhausted to unpack our things, and it was the first of June, but chilly, and we needed and wanted the fireplace that night. Its so exciting when you arrive in a new place and make it your home. And so strange and sad when you leave. You walk around your space and you think to yourself...this will be the last time I will see how the light comes into this room in the morning. This is the last time I will shower in this bathroom. This is the last time I will make coffee here in this kitchen. This is the last time I will look out this window, into this yard, to see those trees and mountains and rising sun from this angle and this place. This is the last time I will exist in these rooms, in these walls, in this space. 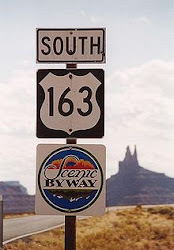 I am very excited about my new adventure - the scenic byway calls. Its just for these last hours, my focus will remain here. As I think it should. Stained Glass Windows are Done!!! 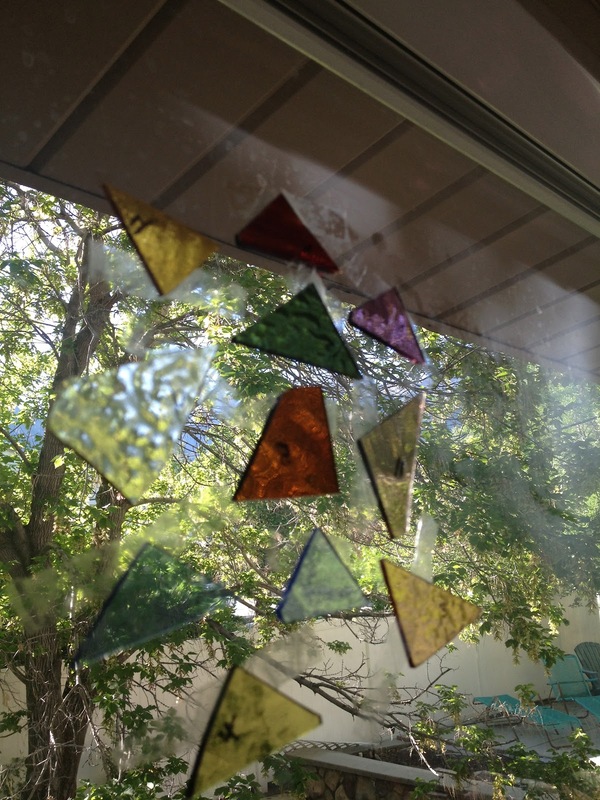 I encourage you to design your own stained glass windows if you get the opportunity. Its so much fun and not as expensive as you might think. Thanks to Beehive Glass in Salt Lake City for doing such a great job and turning around our order so quickly. If you want to check them out, ask for Kathleen and Brigetta and tell them the Hadleys sent you. We picked them up today and got to take a peek before they were safely crated up so we can carry them down to California tomorrow. Here are a few photos of our two windows in the crates. One we chose to go square shapes and it will be by our front door. The other we chose angular -triangles - and this will go at the top of our stairs leading to our roof deck. I don't write much about music here. This is not a music blog. But this blog is about travel, and what is travel without a soundtrack? Music is a part of the byway - always. Every adventure, every road trip needs a soundtrack. So, occasionally I do write about some music stuff. This morning I just bought tickets to see Dr. Dog all the way out in October (!). I wouldn't normally buy tickets for a show so far in advance because I typically have no idea what I am going to be doing 3 months from now. I travel a lot for work and things come up. But the band is playing at Pappy & Harriet's in Pioneertown (my backyard in less than one week!) so how can I miss that? I like small shows - that is about all I can handle at this point in my life. I want an intimate music experience, not to be a speck in a giant crowded stadium where I have to see the band with binoculars. P&H is a fabulous venue and I can't believe a band like Dr. Dog is playing such a small venue. Absolutely I am going. However this blog entry is not about Dr. Dog. It is about the Rosewood Thieves. Listening to Dr. Dog reminded me of them. I stumbled upon this band in 2008 at a small bar on H Street, in Washington, DC. I think it was at the Red and the Black. I can't remember. But we were there to see a friend who was in a local band. The friend's band were ok, really just goofing around. Unbelievably the band that opened for them was The Rosewood Thieves. I say unbelievably because unlike this friend's band, this was a serious for real touring band. Standing around waiting for our friends to perform, I watched the Rosewood Thieves show and was blown away. This was a tiny room. There weren't even 50 or 100 people in the room. I was right there feet from the band. It was one of those rare magical music moments in life - when you just stumble upon a band and see this intimate performance and it sticks with you forever. Its a great music on the Byway memorable moment. I loved them. They were selling their CDs and I bought all three of them. To this day they are some of my favorite CDs (and I have 34 days worth of music on my computer music library). I love every single song they've done - all 22 songs. This New York based folk rock band was formed in 2004 and was fairly active until 2009. Lead singer and guitarist Erick Jordan started the band. You may have heard them and not known it as a few of their songs appeared on tv shows. Their song Los Angeles was on Entourage and Grey's Anatomy. I've checked periodically to see if they had any new releases. No. Tours? No. This morning I decided to do a little research and I couldn't find anything about them! Then sadly, I found this article. http://www.7dvt.com/2011breakdown. Well now I know. The band broke down and broke up. The lead singer seems to be getting his career together again, with a new group of musicians forming the Rosewood Thieves. That is good. I like his voice (a bit of Bob Dylan in there?) and I hope the new band can carry on the beauty that was started under the original band. But its all made me a little sad because damn I love this band. Yes, there is a new band, but will it be the same? I sure hope so. Not a great quality video, and not a great version (recorded one is fantastic) but probably my favorite song from the band. Sorting and packing has a way of taking you down memory lane. Today I spent hours and hours cleaning out my files and shredding years and years of old paperwork. As I was shredding old credit card statements dating back (dare I say it?) into the 1990s...I was able to see glimpses of my life. The places I used to shop back in the 90s in DC; restaurants and shows; the time when I moved with my ex husband into our first house and bought a lot of furniture; the years I spent traveling South Asia for work and shopping like a fiend, making sure I spent every last dime of my per diem and then some on local arts and crafts; the retail therapy I practiced when my first marriage fell apart...ahh yes, the memories - good and bad. Then I had to head to the dreaded basement where I have boxes and boxes of stuff I brought here from DC and haven't really dealt with in the two years we've been here. Boxes full of stuff from my childhood and teen years and college years that sat in my parent's attic until I took them two years ago. I plan to sort some of it a little tomorrow, but there won't be time to do a thorough sort now. For now all of them and most of our things will go into storage while we rent a place and until we finally move into our house at the end of this year. Then there was the sorting and packing of all of my books. I purged a lot of them when I moved out here. There aren't many more to purge because the ones I've kept are some of my favorites or (I am ashamed to admit) many, many I still haven't read but I do want to some day. Am I kidding myself to think I will read those books? I hope not. Then there are all the CDs from the days when we still bought CDs. I can't get rid of them yet, because many of them I haven't had the chance to copy onto my computer yet! I don't have space. I've got 72 GB on my computer and can't really add more. Some day soon I hope. I wish I could hire someone to organize all of my music for me. Much of the art I've collected is still wrapped up from moving last time. Files, books, music, art, photographs, old letters, memorabilia - things that tell the story of a person and their life. A life of memories in boxes. Stained Glass Window is Coming Together! In my last post I told you about our stained glass window project for our new house. 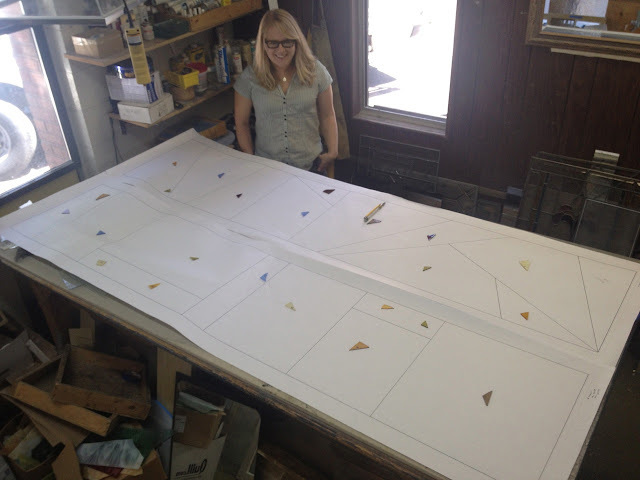 Today I got to go down to Beehive Glass and look at all the glass that has been cut and laid out before they finish it. I am so in love with these windows. They are going to be awesome. The colors won't be as bright as you see here because in these images they are laid out against a white background. When they are up and you are looking through them into the air and light, the colors are much more muted and you see all the different textures. 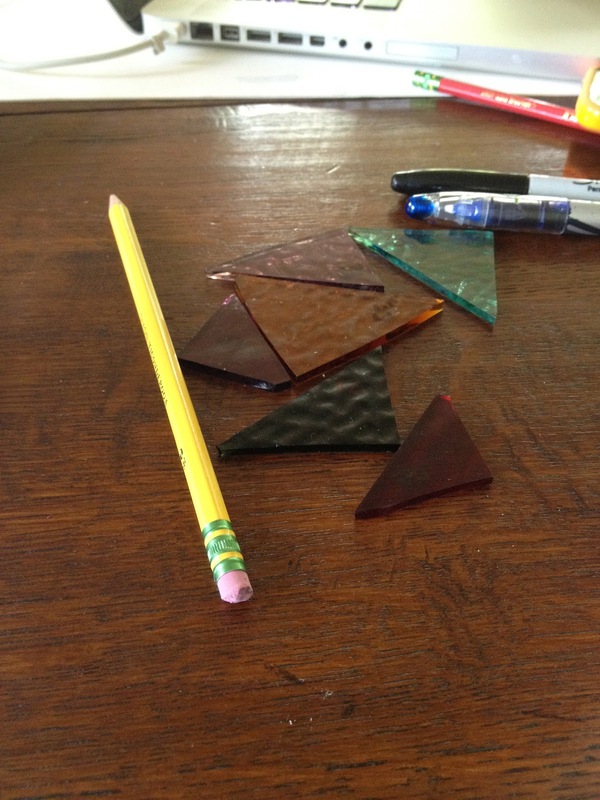 In addition to using different colors, we have used different types of textured glass. Stained glass is just so cool. I can see why someone would want to work with this material. 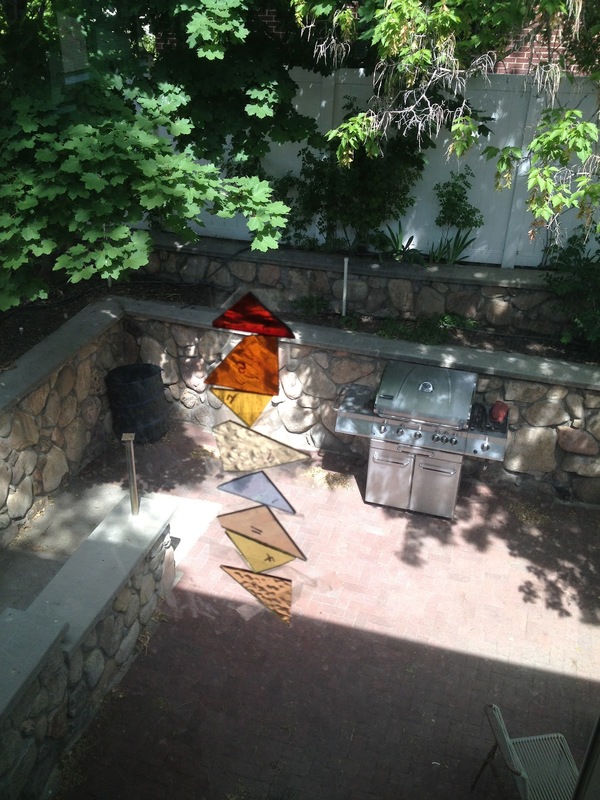 I don't think this will be our last stained glass project. When we started thinking about building our desert house we looked through numerous design books from the local library and all over the internet for images and ideas to help guide us. 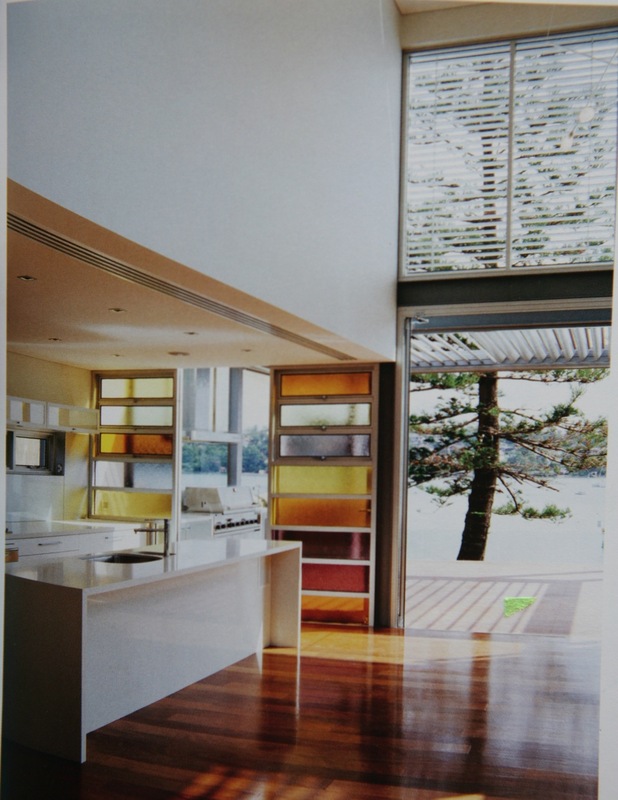 One image we really loved was this one using colored glass in a kitchen. As we drew up our plans we added something like this in the kitchen, then elsewhere throughout the house. By the time we were finalizing our window order and getting ready to start framing (just within the past few weeks), we changed our minds. The idea was becoming very expensive as it required so many small individual windows; we didn't need the extra glass in the kitchen/great room; and we worried about so much color clashing with other planned colors in the room. However we did not give up on the idea of having some stained glass in the house. We felt that we needed something to add some uniqueness to the Pella windows, which although really great windows, are still just your usual kinds of windows. So we decided to create a stained glass window to go by the front door and then one at the top of the stairs that will lead up to our roof deck and cabana type room on the roof (which will be a second guest bedroom and bath). Both windows will be 7.5 feet high and just under 2 feet wide. We will have the glass all in one window instead of separated windows as we had originally envisioned, to keep costs down. Near our house in Salt Lake City we had seen a glass company called Beehive Glass. So we checked it out, liked what we saw, and proceeded to work with them to create our windows. Its a small shop with friendly staff and they seem to be very busy. During our first meeting we told them what we wanted to do, talked about colors, and mapped out some sizes and costs. They gave us about 15 samples (they cut off a small shard of large glass panels) to take home and work on the colors and to finalize the design. My husband and I decided this would be my project to finalize the design and the colors. So I spent about 2 weeks playing around with it. Its hard to imagine how colors will look next to each other when you are looking at tiny shards. Plus each glass looks different in direct light vs diffused light or when placed on a piece of white paper. It was a challenge, but a very fun one. 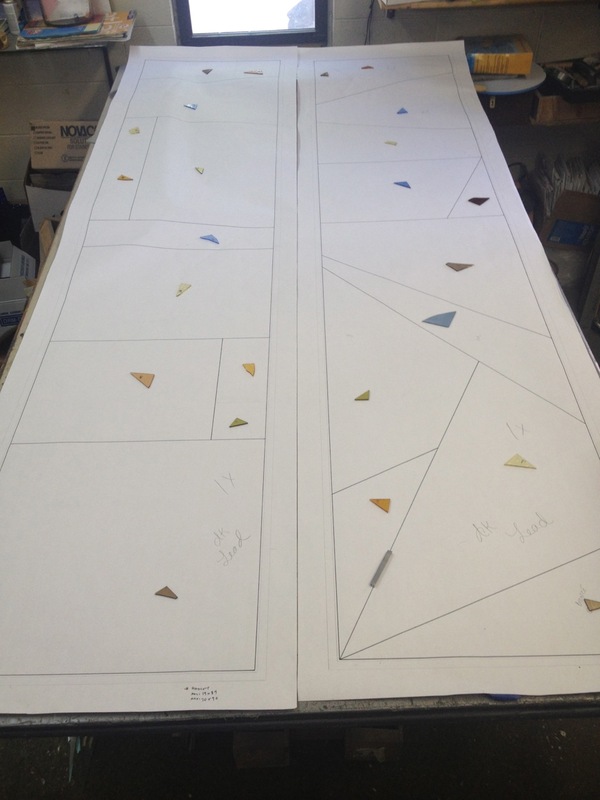 I never thought I would get to design my own stained glass window! Last week we submitted the final design and color selection and then the Beehive Glass crew got to work drawing a large mock up of what we wanted. We went in again on Friday to see the final results, made some last minute color changes and....here you have our final design! I can't wait to see the final product - to see the colors in full size. Stay tuned...we hope to have them done in two weeks to take with us on our move. It has been good working with Beehive Glass and I would recommend them to anyone in the area wanting some glass work done. The one on the left will be by the front door - the one on the right at the top of the stairs. Its an anniversary of sorts for me. Right around this time two years ago, we set off on an adventure together. In May 2010 we sold my house in Maryland, packed everything up in a Penske truck, drove across America with my car in tow and my two cats, and arrived in Salt Lake City to find a place to settle for awhile. It is that trip across the country, and starting a new life, that inspired me to start this blog. I came up with the name My Scenic Byway on that drive. After staying a week at a La Quinta Inn (they take pets) and hunting for a place to rent, we were just about to give up and consider putting our things in storage and shacking up with family out here for awhile, then the Friday before Memorial Day weekend, we found our dream rental house. It was perfect. We couldn't believe how lucky we were to find this place. So we moved in that Memorial Day weekend, two years ago. Two years have flown by. Living in this house at the foot of a beautiful canyon in the Wasatch Mountains, looking down over Salt Lake City, our relationship and love has grown. We arrived and starting planning a wedding which took place just months after arriving here. We also experienced great loss and heartache here, unexpectedly losing a very important family member - making it feel like the timing of our decisions and arrival here to this place was all the more important. Family and friends have shared this house with us. Because I work from home, I have spent an enormous amount of my time over the past two years physically in this house. All day, every day during the week, I am here in this house. This house has always felt safe, a refuge. Open and full of light. Many large windows looking out onto trees and mountains. The best kitchen I've ever had. The sounds and feel of the evening breezes that roll down the canyon rustling the aspen leaves on the trees in the front yard. The sounds of the quail who frequent our yard. The cherry trees in our front and back yard. I have loved this house. And this is the house where we started our vision and dream to build our own house in California, in the high desert near Joshua Tree. My husband has owned land there for many years and has always had a dream to build there. His dream became our dream. We've spent much time in this house huddled over house plans on the dining room table or the back patio. Many nights sitting on the couch in front of the fireplace, tv on, but not really watching as we were searching the internet for websites and photos to give us ideas about various aspects of home design. Our living/dining room is covered in house plans, models, design boards with photos, catalogues, etc. And now that room is also filling up with boxes because the vision has been realized and the house is being built, and we are moving. This is to be our last month in this wonderful house, this place of love and fond memories. I become very attached to places. I love to travel, yet I also can find it tough to leave a place. Not so much a place as a space. The space we reside in and make our own - I love those spaces. It isn't that I don't want to leave them, I just find it to be an emotional and bittersweet experience. I am excited about our new home, and sad too to leave this home that has served us so wonderfully for two years. We knew we would only be here temporarily, but somehow the time flies by too fast, like it always does, and suddenly you find yourself packing boxes, saying goodbyes to neighbors, and staring at the birds and the trees and the kitchen and the walls and saying to this space "I will miss you." And sometimes shedding a few tears as you say it. I am grateful to the universe that led us to this beautiful house, and for how it became such a wonderful first home for us to share together. I have memories and images that I will cherish from it always. It was a good, good house. I am excited for the next people who will rent this house and make their own memories here, just as I am excited for our new house and our new journey on the Scenic Byway. Window heights. And shapes and sizes and styles. How high off the ground should you place a window? Seriously I bet most of you have never spent time thinking about this, or as much as I have. Its a big pain, and once they are in, they are in. Have you ever noticed that all of the windows in all houses (at least all the ones I've seen) all have the same top height? I never noticed this before. We spent an enormous amount of time deciding the number of windows, their sizes and styles, and placement, and of course how high off the ground they sit. And be prepared, because windows will be one of the biggest chunks of your home building budget. Placement of absolutely every little thing. Where do you place doors? Which way do you want your doors to open? Where do you place everything else? Electric sockets? Lighting? Ceiling fans? Colors, colors, colors. For the outside wood, outside windows, shutters, porch beams, doors, inside walls, inside window frames and trim, baseboards, floors, bathroom fixtures, kitchen counters, cupboards, and on and on and on and on. Never have I had to make so many color choices! Its exciting and overwhelming all rolled into one. Kitchen Design. Probably my biggest obsession with this house building adventure has been the kitchen. The layout of every square inch. How to place appliances and shelving and cupboards and everything so that the kitchen makes sense - so its user friendly and happy. Having an open slate to design your kitchen is like a dream come too, but it involves a lot of decision making (not exactly my strong point, but boy building a house will sure cure you of this). What can I say? I dream of a bitchin' kitchen. I know I make my husband nuts with all of my kitchen ideas and freak outs about how things have to be just so. Cement. I've learned more about cement and concrete than I ever thought I would know or care to know. We had to make a color decision there too. We had six huge cement trucks and like 20 guys to pour our foundation and I was there to watch the whole exciting and stressful thing. Cement is actually pretty cool. Water. Will the water from our well be drinkable? We haven't had it tested yet. Heating and Cooling. How do you properly design a house, in the high desert, for heating and cooling, so it can handle a lot of sun and high temperatures in the summer, and cold temperatures (even snow) in the winter - powered only by solar. We hope we've got it right, but we'll just have to live in it to really know. Balancing energy supply and use. How will we ensure energy use balances with supply? Is it going to be a problem running various kitchen appliances, an iron, hair dryers, etc off of our solar system? We are going to have a large solar system, but I imagine it will still take time to figure out how to balance out energy use so we don't ever drain the system. I've never lived in a solar powered home. Its very exciting but full of unknowns. Snakes and scorpions oh my! We are going to need a snake bite kit and to know what to do and where to go in the event of. We are, after all, building in rattlesnake country. We also need to buy one of those poles you use to capture snakes and move them away from your property. Its one big exciting adventure full of endless choices and decisions. If you get the chance to do it, I recommend it. Just be prepared to spend a lot of time thinking about things you never thought you would, and to be a little crazy during the process.